After finishing The Last Guardian, I couldn’t stop thinking about it. Trico is one of the best realized characters in gaming, and I wanted to make a tribute. 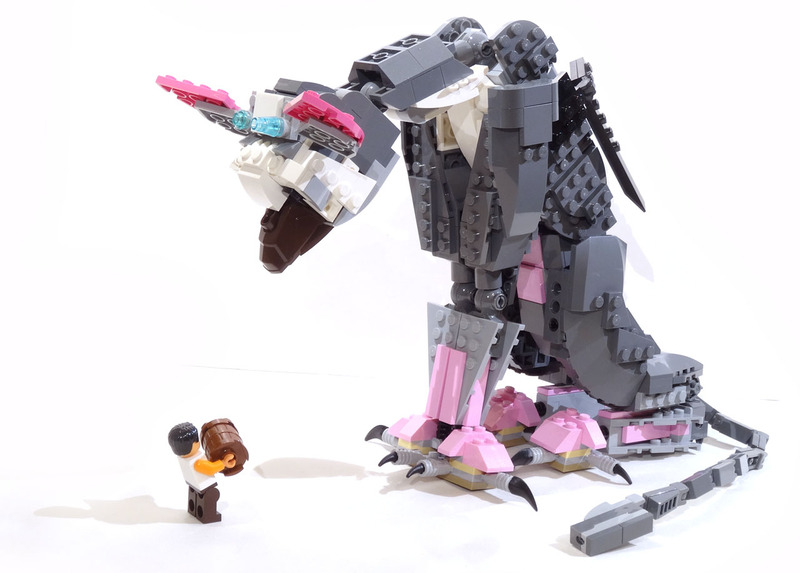 So I sat down to construct my very own Lego Trico. The most important part is the face, and especially the eyes and the nose. I looked through the inventory of parts on Bricklink, searching for a suitably formed dark brown part for the nose. I located one in an unlikely place – the foot of the buildable action figure Rey from Star Wars! Loading this part into Lego Digital Designer, I could figure out the basics to fit the eyes on it. To have the dark areas around the eyes, I placed Erling bricks with the bottom out, and used inverted slopes on these to round off the face. From there it was just a question of building the rest. Having made sketches of some typical poses for Trico, I made a rough skeleton for him. It quickly turned out that some fairly solid joints would be needed, and I eventually added friction joints all over, to the neck and the legs. The back also folds slightly, to keep his silhouette in the important sitting pose. Achieving that pose was fairly tricky, but with a little bit of cheating (turning the front feet sideways) he can sit on a very small platform, just like in the game. The finished model ended up a little skinny, but I felt that it was more important to keep the posability. Aside from sitting down in a few different ways, he can also stand and walk, although his feet mostly need to be on the ground to keep him stable. The tail can also fold up over him to direct a bolt or two at a nearby wall, using the spring-loaded shooter. 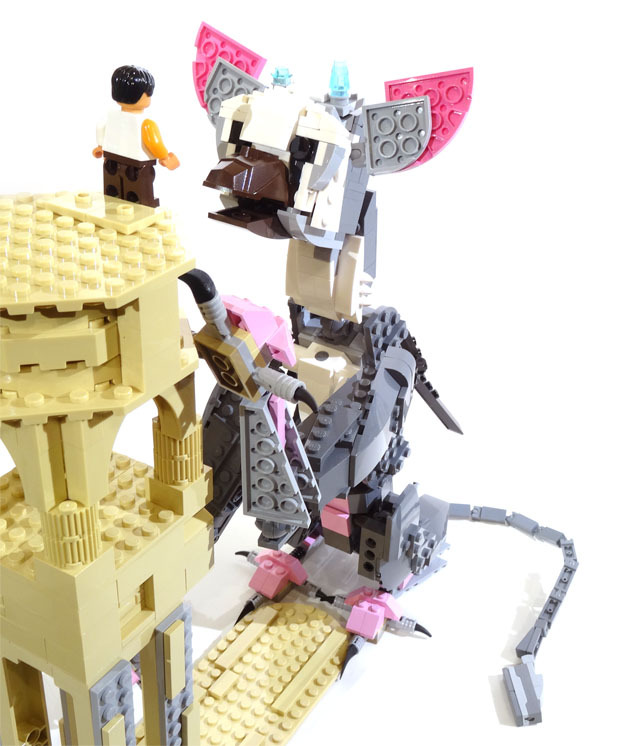 Of course, Trico wouldn’t be complete without the boy. I haven’t made a finished print for him yet, but he’s mostly an accessory to Trico anyway. He uses the face of the kid from Star Wars: The Freemaker Adventures, and carries a shield that was only available unprinted in a Ninjago booster set. I also made a barrel and a few spears, as well as a tower to display him on. Now, I’m happy enough with this model that I want to give it a go on Lego Ideas, so I’ve entered it as a project there. 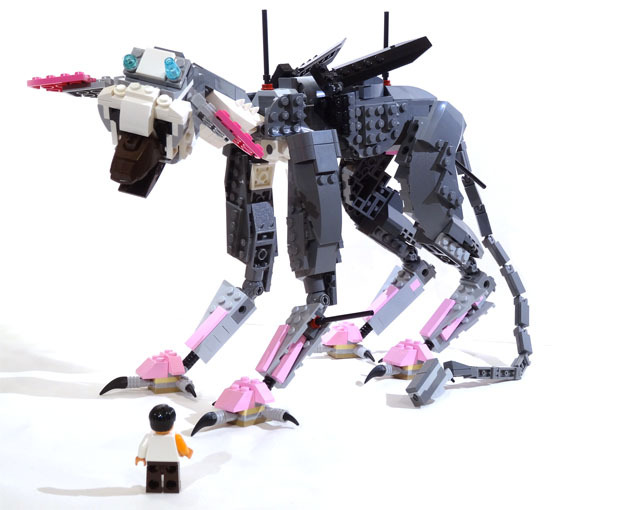 If you vote on it, you may help it become a finished set, designed even better than I can make it by Lego’s own designers. 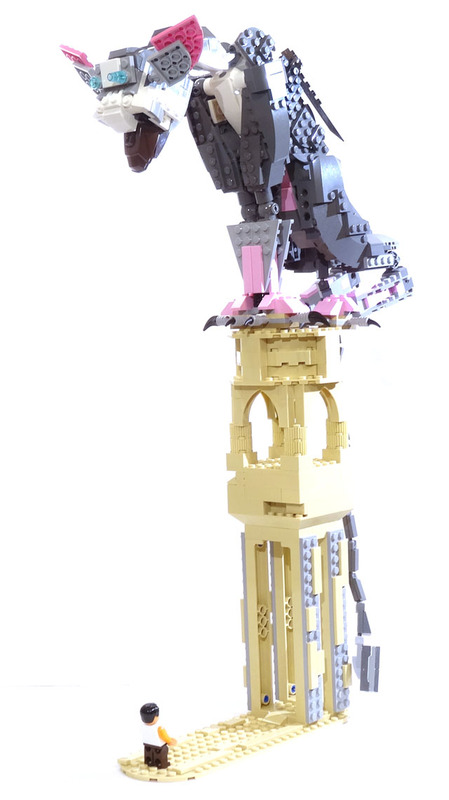 I thought the idea would have already turned up, but I can’t find another brick built Trico anywhere. Obviously they’d need to get the license from Sony but stranger things have happened – there is now both Minecraft, Portal and Sonic Lego. Please take a look at it here. 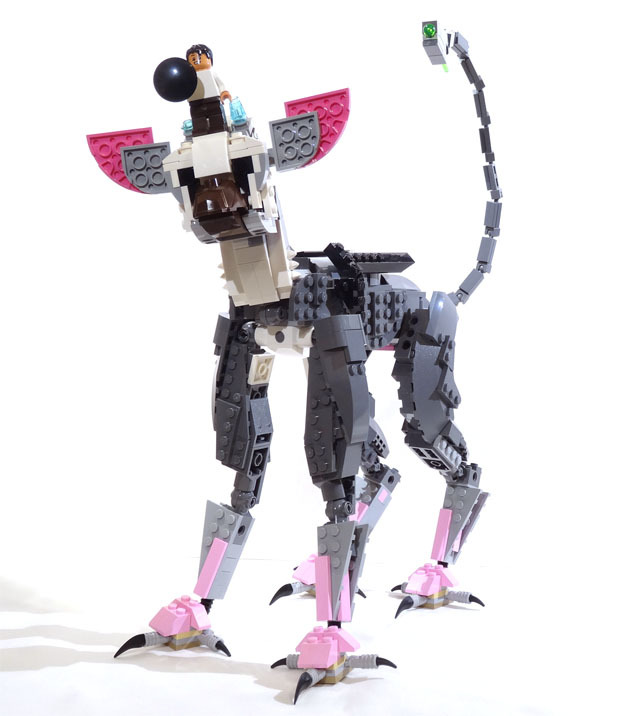 Det här inlägget postades i International, Kreativt, Prylar, Rekommenderat och har märkts med etiketterna Lego, MOC, The Last Guardian. Bokmärk permalänken.